The Trial of the Incredible Hulk is a 1989 American made-for-television superhero film based on the 1978–1982 television series The Incredible Hulk featuring both the Hulk and fellow Marvel Comics character Daredevil, who team up to defeat Wilson Fisk. As was the case with The Incredible Hulk Returns, this television movie also acted as a backdoor television pilot for a series, in this case, for Daredevil (which was not produced). It was filmed in Vancouver, British Columbia, Canada. 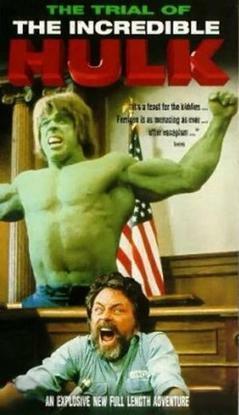 The Trial of the Incredible Hulk was directed by and starring Bill Bixby. Also starring are Lou Ferrigno, Rex Smith and John Rhys-Davies. Despite the film's title, writer/executive producer Gerald Di Pego has stated that the idea of having the Hulk actually go on trial was never even discussed. On the run again after the events of the previous TV movie, A disenchanted and overwhelmed David Banner is working up north under the name David Belson. A bully pushes him around and David tempts to fight him back, but knowing he'll just turn into the Hulk again, he throws the fight and walks away. Later, David makes his way towards a large city with the hopes of renting a room and staying incognito. Unbeknownst to him, the city he arrives in is under the control of a powerful underworld crime boss named Wilson Fisk but is also protected by a mysterious black-clad crimefighter known as Daredevil. When two of Fisk's men come onto the commuter subway train after having committed a jewel robbery, one of them takes an interest in a beautiful woman also riding the train, but she rejects him. When David witnesses an attempted sexual assault by one of Fisk's men, he transforms into the Hulk which results in the usual disruption and chaos. A short while later, David is arrested by the police and wrongfully charged with the crime. While awaiting trial, blind defense attorney Matt Murdock is assigned to David's case. David is uncooperative, but Murdock has faith that he is innocent and is determined to prove so. One night while asleep in jail, David has a nightmare about his upcoming trial and dreams about transforming into the Hulk on the witness stand. The stress of this causes him to transform in reality, and the Hulk goes berserk and breaks free of the prison. Subsequent events see David Banner team up with Daredevil who reveals his identity as Matt Murdock. Matt tells David about his origins which David initially has trouble accepting. Daredevil also reveals that he has an ally on the police force who provides him with information relating to criminal activity. Daredevil goes to investigate a tip provided by his informant, but the tip was planted by Wilson Fisk, and Daredevil is badly injured in an ambush by the Fisk's men. David rushes to save Matt but he is too late to help, his frustration transforming into the Hulk. The creature, in turn, smashes in and saves Matt from Fisk and his men, who flee the scene. Matt, barely conscious, traces the Hulk's face as he transforms back to David, thus learning David's secret. Meanwhile, Fisk has the witness to events on the subway abducted from protective custody in order to have her killed, but she is saved by Fisk's assistant who finds her attractive. Fisk plans a major meeting of underworld crime bosses in order to propose the consolidation of their operations into a syndicate with himself as chairman. Using his training as a medical doctor, David treats Matt's injuries and spreads a cover story that Matt's injuries are a result of falling down stairs. While Matt's self-confidence is seriously shaken, David's confidence has been restored by seeing how Matt has embraced his unique gifts also caused by exposure to radiation. After a little coaxing from David, Matt begins to recover and retrain his body. Soon enough, the two return to work and go to save the captured woman. The two engage Wilson Fisk and his men and ultimately succeed in besting him, without the Hulk appearing. Fisk and his assistant escape, and the prisoner is freed. David and Matt part ways as friends and allies. David continues his search of a cure for himself, and Matt remains in the city to protect it. This movie was the first live-action Marvel film or television project to feature a cameo appearance from famed creator Stan Lee, as the jury foreman in Banner's imagined trial. Though it did not succeed in giving birth to a Daredevil television series, The Trial of the Incredible Hulk garnered very high ratings. Viewers were less enthusiastic about it than The Incredible Hulk Returns. The most common criticisms were the absence of the Hulk himself from the final act and the misleading title (the "trial" only takes place in a dream sequence). This television film was released on VHS by Starmaker Videos in December 1992. It was released by Anchor Bay Entertainment on May 13, 2008 along with The Incredible Hulk Returns as a DVD double feature. They were re-released by Image Entertainment on October 11, 2011. ^ Harmetz, Aljean (1988-10-11). "Superheroes' Battleground: Prime Time". New York Times. Retrieved 2010-08-12. ^ "F.O.O.M. (Flashbacks of Ol' Marvel) #16: "I'm Free Now – The Incredible Hulk (1988-1990)"". Comic Bulletin. Archived from the original on 2013-10-29. Retrieved 2010-09-09. ^ "The Trial of the Incredible Hulk". Turner Classic Movies. Atlanta: Turner Broadcasting System (Time Warner). Retrieved December 12, 2016. ^ a b c Glenn, Greenberg (February 2014). "The Televised Hulk". Back Issue!. TwoMorrows Publishing (70): 25. ^ Mangels, Andy (January 1993). "Hollywood Heroes". Wizard. Wizard Entertainment (17): 39. This page was last edited on 8 April 2019, at 22:27 (UTC).